T0927906CD8 CENTRALINA SCATOLA FUSIBILI RELÈ MAZDA 2 1.3 55KW 5P B/GPL 5M (2009) RICAMBIO USATO. Anno: 2009. Se indicate, le compatibilità qui riportate sono risultate da catalogo non ufficiale. - COD contrassegno (Solo in italia - Selezionabile solo da PC). Mazda MX-5 NA Relè Relè LA10. Relè Relè LA10. Tipo MX-5 NA. Marke Mazda. Elenco delle applicazioni del veicolo. Saremo lieti di aiutarvi! La definizione della pagina è sempre in direzione di marcia! Mazda 4-lama nera candelette relè RF5C 18 651 NGK G75SH 3YC 12V. Reference OE/OEM Number G75SH. Reference OE/OEM Number RF5C. Manufacturer Part Number RF5C. Genuino4-lama Nero Relè /Candele di preriscaldo relè relè. MAZDA 6 2004 IMASEN UNITÀ RELÈ. Model year 2 ° 1998 generazione NB. Marke Mazda. Elenco delle applicazioni del veicolo. Siamo qui per aiutare! La definizione della pagina è sempre in direzione di marcia! Blocco porta relè. Colore Vegetazione. Reference OE/OEM Number X1T14371M1. Reference OE/OEM Number NL97121873. Reference OE/OEM Number BJ3D675G2D. Manufacturer Part Number X1T14371M1. Other Part Number X1T14371M1. Other Part Number NL97121873. Mazda 323 C V BA 1.5 16V 1994/08-1998/09 1489 CC, 65 KW, 88 CV. Mazda 323 FV BA 1.5 16V 1994/07-1998/09 1489 CC, 65 KW, 88 CV. Mazda 323 P V BA 1.5 16V 10/1996-1998/09 1489 CC, 65 KW, 88 CV. Mazda 323 S V BA 1.5 16V 1994/08-1998/09 1489 CC, 65 KW, 88 CV. 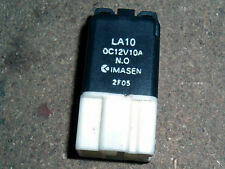 Relay, LA10, Mazda MX-5 mk1, USED. Goes in the fusebox under the bonnet (fan), or under the cover near the wiper motor on the l/h inner wing (horn) or behind the carpet at the rear of the boot (HRW). Reference OE/OEM Number BG2M67830. Manufacturer Part Number BG2M67830. Other Part Number BG2M67830. Custom Bundle No. Unit Type Unit. PARTE INFORMAZIONI. Parti dell'OEM dell'UE. Fits all NB models 1998 to 2000, UK and import. This is black or cream in colour (they are interchangeable) and has 3 pins. Flasher unit, Mazda MX-5 mk2, BG1P66830A, USED. Relè di Mazda MX-5 NB 3464-100-120. Tipo MX-5 NB. Model year 2 ° 1998 generazione NB. Marke Mazda. Elenco delle applicazioni del veicolo. Saremo lieti di aiutarvi! La definizione della pagina è sempre in direzione di marcia! 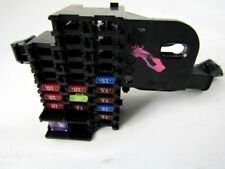 Mazda (1995 - 2005) 323 626 Demo Premacy MPV 4-Pin Black Relay B5B4 DC12V N.O Imasen Japan. Other Part Number: B5B4. Made in Japan by Imasen. 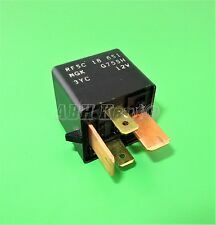 Genuine 4 Pin Black Relay /Multi-Use Relay. Genuine Mazda Part. Used MK1 MX-5 Eunos or UK Right hand Drive. All parts are used and from Eunos or UK MK1 Models. Indicator Flasher Hazard Relay. 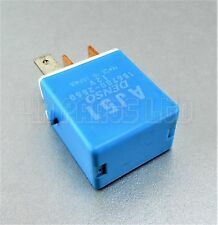 Flasher Hazard Indicator Relay, this is the one you see in the Photo. Code 3211-167-320. MX-5 Antennenstab NB f. elektr. 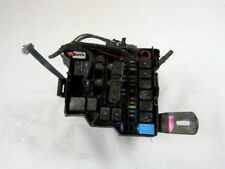 Antenne Mazda MX-5 NB 1998 - 2005 elektrisch. MX-5 Schaltmanschetten Satz Mazda MX-5 NA NB NB/FL 89-05 orig. I.L. Motorsport. MX-5 Seitenblinker Leuchten Satz Blinker ND dunkel getönt Mazda MX-5 Typ ND. PM Sports Cars LTD: The UK's largest used Porsche and Mazda MX5 parts supplier. With humble beginnings in 1983 as a hobby restoring Triumph Spitfires, PM Sports Cars LTD has evolved to specialise in all models of Porsche and the Mazda MX5. Fahrzeug:MAZDA 626 (GF) 1997-2001, MAZDA MX-5 II (NB) 1998-2005. Sonstiges: 12-pins (), 12V. Käufer trägt Hin- und Rücksendekosten, im Falle einer erfolgreicher Rückgabe wird nur Warenwert erstattet. Fits all models 1989 to 1998. This is either grey or cream in colour (the 2 colours are interchangeable) and has 7 pins. Flasher unit, Mazda MX-5 mk1, HE0166A30, USED. Also fits Mazda Bongo SGL3, SGL5 & SGLW models, 1995-99. Hohe qualität Relais zu Mazda. VERKÄUFER PROFIL. Other Part Number:G73SP. Genuine4-Blade Black Relay /Glow Plugs Relay Relay. Ford Ranger (1998 - 2012). Madeby Mazda. Condition:Used and Good Working Order. Other Part Number:G75SH. Genuine4-Blade Black Relay /Glow Plugs Relay Relay. Madeby Mazda. Condition:Used and Good Working Order. Tipo: Mazda Xedos 9. MAZDA XEDOS 9 2,0 L 2,3 L 2,5 L Automatica Manuale. Marke Mazda. Elenco delle applicazioni del veicolo. Saremo lieti di aiutarvi! La definizione della pagina è sempre in direzione di marcia! 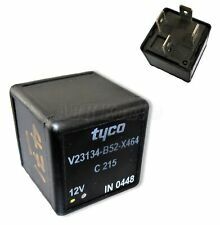 Genuine 4- Pin Black Relay/ Multi Use Relay. Genuine Mazda Part. Made in Japan. Tetto apribile di relè relè Mazda Xedos 9 33 T72 000A. Tipo: Mazda Xedos 9. MAZDA XEDOS 9 2,0 L 2,3 L 2,5 L Automatica Manuale. Marke Mazda. Elenco delle applicazioni del veicolo. Saremo lieti di aiutarvi! 71242 DISPLAY Mazda 3 Berlina (BL)(2009->) 1.6 Active [1,6 Ltr. Parliamo spagnolo, inglese e francese. ]. LA10 Relay ,Used MK1 MX-5 UK Eunos Right hand Drive. LA10 Relay, this is located on the left side inner wing under a black cover with other relays, also in the boot, this is the one you see in the photo. Mazda 323f BA relay for sale. Mazda MX-5 NA relè relè 056700-6381. Tipo MX-5 NA. Marke Mazda. Elenco delle applicazioni del veicolo. Saremo lieti di aiutarvi! La definizione della pagina è sempre in direzione di marcia! Gear Manuale. HD22 Relay ,Used MK1 MX-5 1.6 Eunos Right hand Drive. 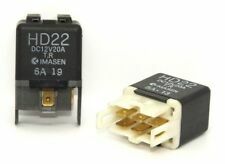 HD22 Relay, this is located on the left side inner wing under a black cover with other relays, this is the one you see in the photo. All parts are used and from Eunos MK1 Models. Fits all NB Facelift models 2001 to 2005, UK and import. This is cream in colour and has 8 pins. Flasher unit, Mazda MX-5 mk2.5, LC6266830A, USED.